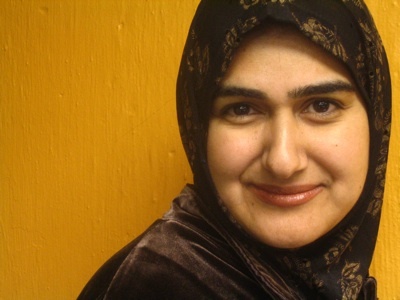 Rohina Malik is a Chicago-based playwright, actress and solo performance artist. She was born and raised in London (UK) of South Asian heritage. Rohina is one of the four Chicago writers in The Goodman Theatre’s Playwright’s Unit. She is currently under commission at The Goodman Theatre. UNVEILED received a second production at Victory Gardens Theater, a third production at Next Theater/Evanston. In Sept 2011 UNVEILED will have its fourth production at Brava Theater, San Fransisco. She workshopped her play YASMINA’S NECKLACE with the Goodman Theatre in their New staged Series in Dec 2009, directed by Henry Godinez. Her third play The Mecca Tales, which is a Goodman commission, will have a staged reading June 2011, directed by Ron OJ Parsons. Five Muslim women in a post-9/11 world serve tea and uncover what lies beneath the veil in this compelling one-woman show. The play can be preformed as a one-woman show, or with multiple actors. Meet Abdul Samee: his father is Iraqi, his mother is Puerto Rican, but, if you ask him, he’ll say he’s Italian. Longing to shed his cultural identity he changes his name to Sam, marries an American, and does everything in his power to turn his back on his heritage. But when Sam meets Yasmina, a beautiful woman from his father’s homeland, he begins to learn that a tree without roots cannot stand.